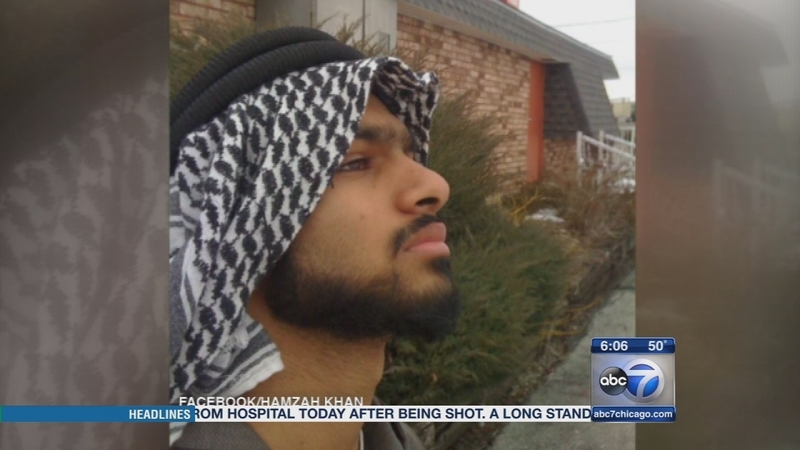 CHICAGO (WLS) -- As TV viewers were affixed on a terrorist take-down half-a-world away in France, a federal grand jury in Chicago indicted a suburban teenager accused of trying to travel overseas to join Islamic State militants in Syria. In a single-count indictment, Mohammed Hamzah Khan, 19, of Bolingbrook, was charged with trying to provide material to ISIS. A grand jury handed up the charge Thursday night, the I-Team learned, but it was unsealed Friday morning. While a connection is not alleged to the slaughter and siege in Paris this week, the Khan case and the France incidents do reflect a wider concern of law enforcement: extremist sympathizers from Western nations who travel overseas for jihad training and sometimes actual combat. The Chicago indictment formalizes a criminal complaint lodged against Khan last October after he was arrested at O'Hare Airport, about to leave for Vienna en route to Turkey and then Syria. Once overseas, Khan intended to travel by bus to a transit point where he would meet an ISIS operative who would get him into Syria, according to federal agents. Prosecutors claim Khan was radicalized and that he recruited his 16-year-old brother and 17-year-old sister. They were preparing to travel overseas as well, although have not been charged. Mohammed Hamzah Khan. Courtesy U.S. Attorney's Office. After Khan's arrest, the FBI found diaries and letters in which the teenagers fumed about U.S.-led bombing campaigns in Syria and Iraq that targeted the Islamic State. He has been locked up in the MCC-Chicago since being arrested and is held without bond. He is represented by Chicago defense attorney Thomas Durkin, who is handling several similar cases in the Northern District of Illinois. Khan was born in the US and lived with his parents in southwest suburban Bolingbrook. He attended Benedictine College in Lisle for one year. The teenager is schedule for arraignment in federal court next Tuesday, Jan. 13 at 9 a.m. in front of Magistrate Judge Susan E. Cox.